An RLseries Circuit is an electrical circuit driven by a voltage or current source and contains resistors and inductors. It is also called an RL filter or RL network. Let us consider the simple RL circuit in which resistor 'R' is connected in series with inductor 'L'. The voltage source is denoted as 'V'. Let 'I' be the current flowing through our circuit and 'IR' and 'IL' be the current flowing through resistor and inductor respectively. As we know for any series circuit current remains the same, i.e. IR = IL = I. 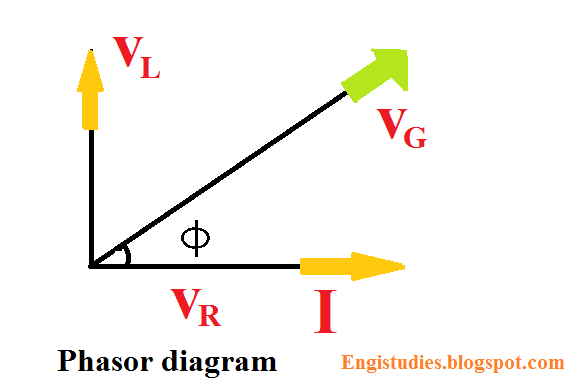 Draw the horizontal axis, taking current phasor as the reference. The voltage across resistor 'VR' is in phase with current I, therefore it will be directed along the same axis that of 'I'. 'VL' Voltage across inductor will be drawn a perpendicular to current phasor as it leads current by 90 degrees. The resultant vector will be 'VG' as shown below. It will be at an angle to the current phasor by Փ.